You either get Wriphe or you don't, and if you don't -- Wriphe gets you. 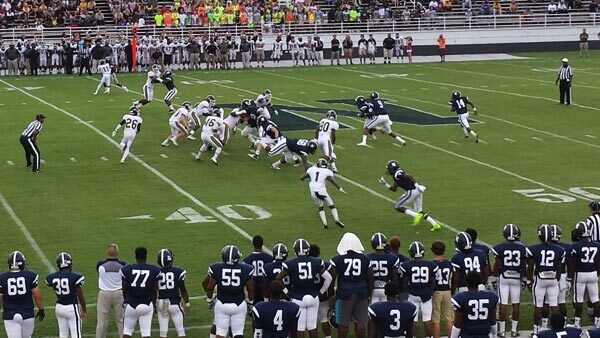 Mom and I kicked off football season last night by attending the season opener of our alma mater, Newnan High School. The Cougars defeated the Carrollton Trojans 13-34, so you know the home crowd was enjoying itself. We were accompanied by Mom's high school classmate, Bill, who played for the team in 1965. It was his first visit to Drake Stadium since 1970. When asked how he felt about returning to attend a game after all these years, he said, "old." I'm glad I went. I, for one, am ready for some football. You say that "Mom and I" attended a Newnan High School football game, accompanied by " her friend Bill." In fact, Nevelle and I made plans to attend the game, and, as we were leaving the house, she asked if you wanted to go WITH US. Again, it's all about you and your needy relationship with your mother. Grow up. Be an adult. Look in the mirror. Do you like what you see? If you had three dice and I gave you three more, how many would you have?